First Transit, which operates fixed-route transit services through a contract with the City of Phoenix (Ariz.), recently won two distinctive awards in the area. The company’s Phoenix location, under the direction of Environmental Manager Heloise Cook, received ISO 14001 Recertification for their compliance with the highest environmental management standards. "Maintaining ISO certification is an ongoing process," explains First Transit GM Allyn Keller. "Once received, the certification must be renewed annually through rigorous audits, during which the organization is required to demonstrate not only adherence to the prescribed standards, but must also show proof of continuous improvement." 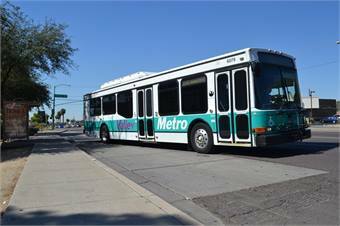 In addition to the ISO 14001 Recertification, the First Transit Phoenix location was also awarded the Maricopa County (AZ) Air Quality Excellence award, as part of their commitment to the county’s Clean Air Campaign. This award is presented to those who have demonstrated exceptional leadership and made notable contributions in protecting and enhancing air quality in Maricopa County.